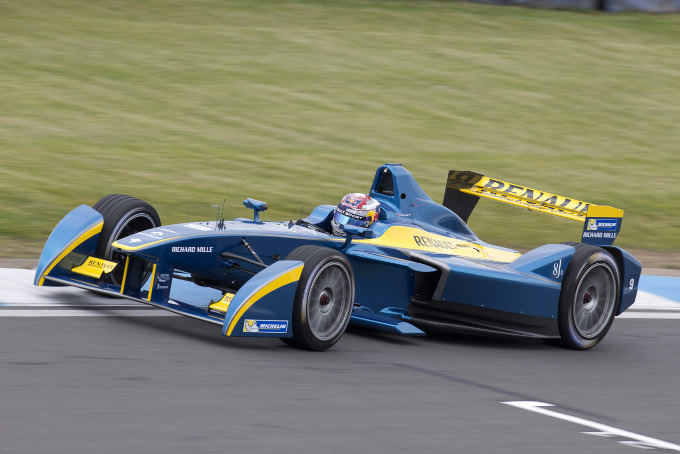 E.dams-Renault's Sebastien Buemi set the fastest time at the end of the first day of official Formula E testing at Donington Park. In dry, bright conditions, the Swiss racer posted a 1:35.475s with under an hour to go in the afternoon session, holding on to the top spot until the end of the day. The first of five public tests saw all 10 teams and drivers use the full Donington Park GP circuit, modified to include an additional chicane at the exit to the Old Hairpin. Lucas di Grassi driving for Audi Sport ABT finished over half a second shy of Buemi despite only running during the afternoon session, replacing team-mate Daniel Abt who left for GP2 duties mid-way through the day. Briton’s Sam Bird (Virgin Racing) was a further three-tenths back in third with Mahindra's Bruno Senna in fourth. The day started with a flurry of activity with Abt setting the early pace and topping the timesheets during the lunch break. Without the rain that hampered track time during the shakedown last month, drivers were able to get a feeling for the fully-electric Spark-Renault SRT_01E ahead of the opening round in Beijing this September. Venturi’s new signing and ex-Le Mans driver Stephane Sarrazin rounded out the top-five during his first outing in a fully-electric single-seater. Nicolas Prost (e.dams-Renault), son of the four-time Formula 1 World Champion Alain, only managed eleven laps and finished over a second adrift of his team-mate. Monaco Grand Prix winner Jarno Trulli stepped into his own car for the first time since acquiring Drayson Racing. The 39-year-old completed the session in seventh place with his new team-mate Michela Cerruti failing to complete a lap due to technical issues. Virgin Racing's Jaime Alguersuari and Karun Chandkok (Mahindra Racing) completed the top-10. IndyCar legend and Formula E Ambassador Gil de Ferran got his first taste of the SRT_01E and came home in a respectable 17th ahead of fellow compatriot Scott Speed. De Ferran said: "Ever since this series begun I have been curious about driving an electric race car. To understand and get a feeling of the varying characteristics of the powertrain and gearbox is fascinating."